"Brit-Cit, the 22nd century. Sam Slade is a Robo-Hunter, a private detective hired to find missing droids or track down malfunctioning meks. Partnered with his idiot robot understudy Hoagy and his hot-headed robo-cigar Stogie, trouble is never far away when Sam's on a case - and when the creds are running dry, Sam will take any case that he can get his hands on..."
by crazed machines. He was joined later in the series by two droid sidekicks: a clueless apprentice named Hoagy, and a pugnacious robo-cigar named Stogie (made in Havana, of course). Peter Hogan, Chris Weston and Rian Hughes, before the strip took another hiatus a few years later. 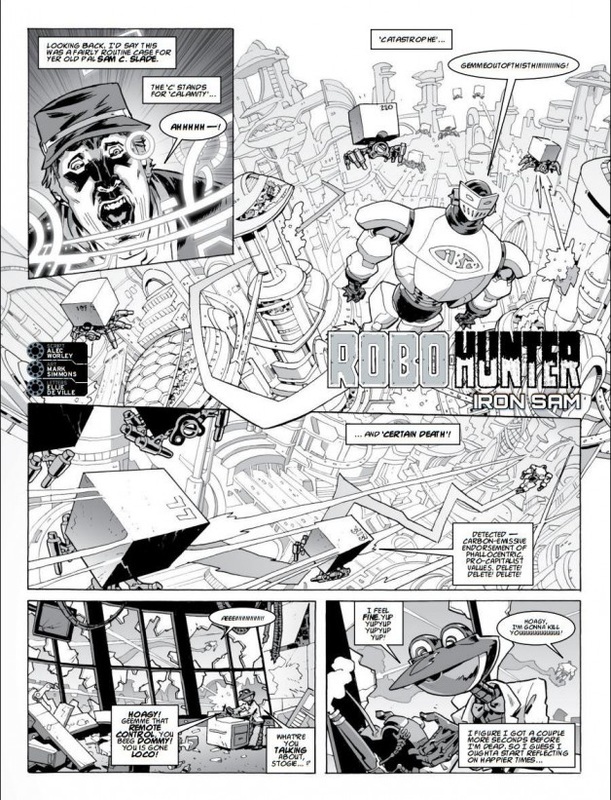 Editor Matt Smith invited me to contribute a one-shot story for the 2000 AD Sci-Fi Special (May 2014), which he intended as a showcase for 2000 AD's new generation of creators to work on classic characters. The story proved popular enough for me to be re-commissioned to work on the character the following year. 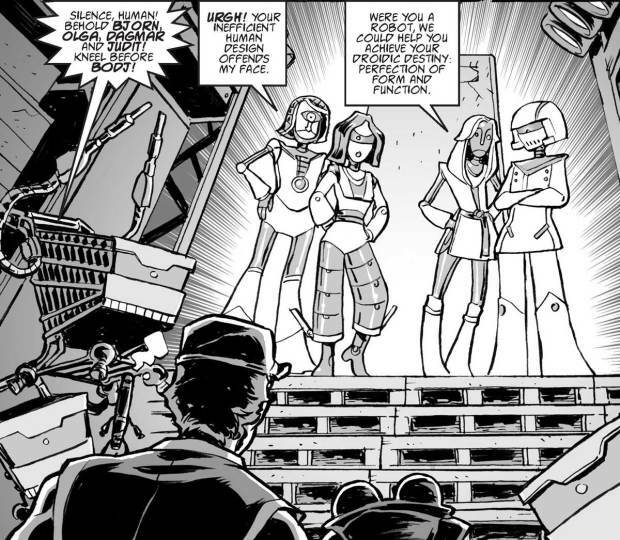 One-shot, with art by Mark Simmons, and letters by Ellie De Ville, in the 2000 AD Sci-Fi Special, May, 2014. Sam Slade is back! And he's doing a little shopping. A missing droids case leads the veteran robo-hunter and his companions - dimwit droid Hoagy and robo-cigar Stogie - into the depths of a nightmarish furniture emporium, where death comes flatpacked and escape is out of stock. One-shot, with art by Mark Simmons, and letters by Ellie De Ville, in the 2000 AD Sci-Fi Special, June, 2015. Brit-Cit is under attack from a sentient social media virus. Anything these intolerant invaders deem offensive will be deleted! Only one man can stop them: battle-suited billionaire Leo Sharp, a.k.a. ‘IRN-BRO’. Unfortunately, the virus has imprisoned Leo inside his own armour. Now it’s up to ace Robo-Hunter Sam Slade and his hapless companions to break into Sharp Towers and reboot IRN-BRO before all life on earth is censored!